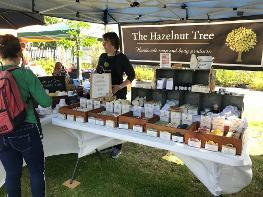 The Hazelnut Tree is a small business based here in the eastern suburbs of Melbourne producing handmade soaps and body products. 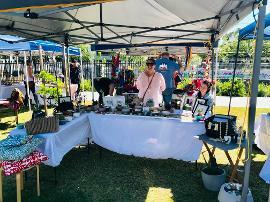 Hazel has been a regular with us at the Blackburn Craft Market for eight years and her products can also be purchased from the “Market Fair” 2/794 Burwood Hwy, Ferntree Gully. She lives just around the corner. At busy times she ropes in her children and husband to help on the stall making it a family affair. As you can see from the photographs, there is a beautiful unique range of soaps poured and cut by hand. 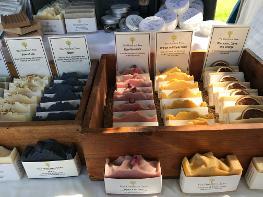 She makes her soaps using the traditional cold process method from olive oil, castor oil, coconut oil, avocado oil and hemp seed oil – no palm oil here. Hazel then uses natural colours, plant extracts and essential oils. The range also includes liquid soaps, shampoo bars, moisturisers, lip balms and more. She has an unscented range for people with sensitivities. 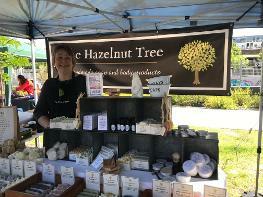 Hazel will be happy to talk to you about any of her products as she personally makes them. Come along to the Blackburn Craft market or email her. To make things simple, you can pay by EFTPOS. Jo is a cheerful stallholder who would be happy to talk to you about any special needs you might have. Come along to the Blackburn Craft market or email them. 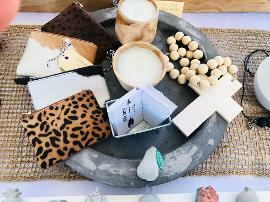 As you can see from the photographs, they have a range of personal accessories including framed original pen and ink drawings, hide and leather purses, hand crafted clay bead jewellery, and cushion covers. They put their perfumed candles into concrete bowls which Ebbie’s partner makes, he is actually a concreter by trade. You can also get larger concrete bowls beautifully polished on the outside, some of which contain succulents. To make things simple, you can pay them by card. Originally of Greek heritage, they are well settled locals now. Your intrepid reporter had difficulty getting much information out of them………… they did not like talking to “the press” ie the Rotary website writer. I just managed a quick few words from Terry and Irene before being shooed away. These fresh vegetable stall people have been coming to the Blackburn Craft Market for over 2 years. 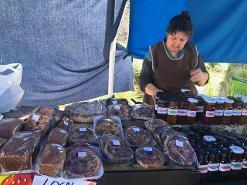 They have had an egg farm at Coldstream since 1982 and have been selling at markets in Mt Waverley, Warrandyte and Longwarry for 20 year and also have a shop in Garfield. 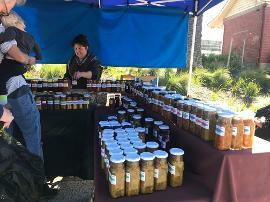 They also sell a whole range of home made chutneys, pickles, and relishes plus various quiches like spinach&tomato, spinach&capsicum, mushroom&leek. Yarra Valley Eggs including free range can be bought as well. 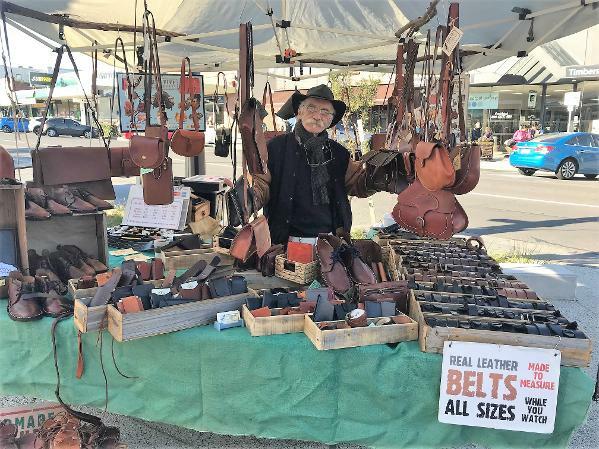 The Earthfive leatherworks stall is operated by Peter Davies who has been a leatherworker since 1969, with a few years in between as a graphic designer. 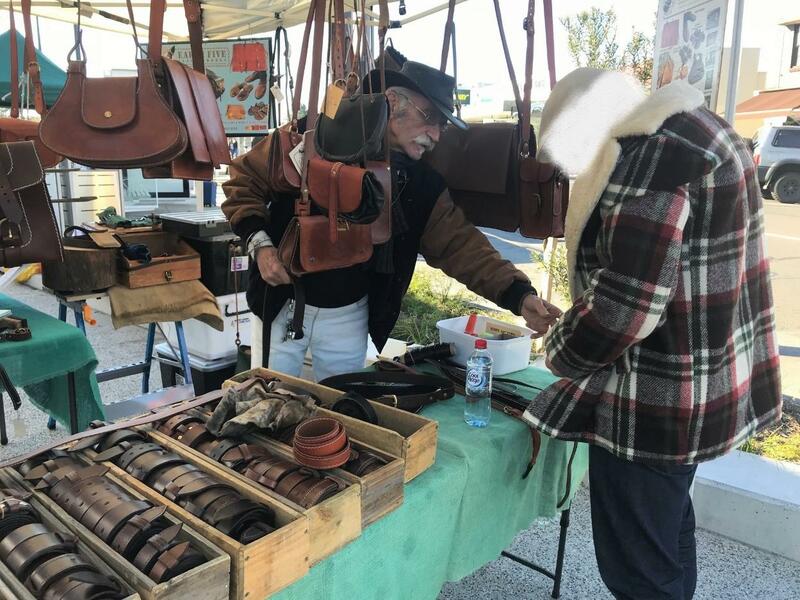 Peter was telling me, between making made to measure belts for three different customers, that he started his leather journey when he made himself a bag from a goatskin in Kabul in 1969. He was travelling overland from the UK to Australia and wanted to replace the shoulder bag he had. So, he made one! He then made a few more for friends. When he arrived back in Melbourne an old friend heard about his bag making in Kabul and handed him a couple of hides he no longer needed and suddenly this became EARTH Leatherworks in Glenferrie road, Earth ll in London when he started travelling again and Earth Three in New York when he moved there. Returning to Australia he had a big workshop employing 10 staff. Now he is on Earthfive. He has been coming to our Blackburn market for more than 4 years. Peter makes shoes, sandals, handbags, purses, wallets, wrist warmers, glasses cases, three legged stools, you name it. He has made leather thigh length boots and helmets for films and the theatre. He will quote on any repairs. He takes credit cards and you can use PayPal. Come and see him at the Blackburn Market or Cockatoo, Mulgrave, or Belgrave markets. 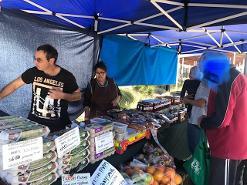 The Calabro stall is operated by Josie and Paul. They have been coming to the Blackburn market for more than 5 years. 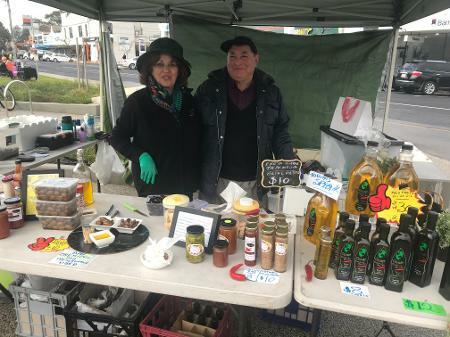 They live locally in Knox but also Paul lives a lot of his time on the Calabro Olive Grove at Toolleen near Heathcote where they have been growing olives on 87 acres for more than 20 years. Josie and Paul have run fruit shops locally all their lives including one in Blackburn. 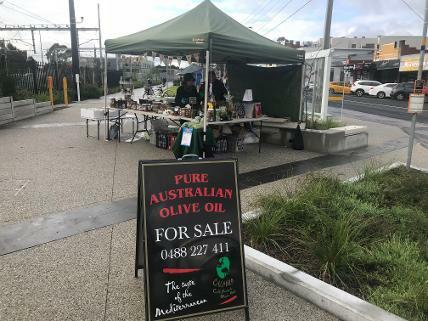 When they decided to retire 5 years ago they thought they’d have a hobby of continuing selling their cold pressed olive oil, marinated olives, tapenade, chillie jam etc. 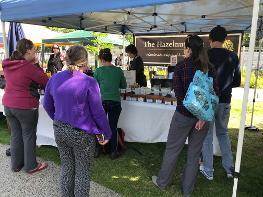 This has grown to having a stall at local markets every Saturday and Sunday in the year! They originally came from Calabria. She was only 21 when she came over here by boat in 1971 with two young children and Paul. They now have a grown up family of four. Paul is 76 and uses some help to pick their olives. He told me they grow many varieties including Frantoio, Calamata, Manzanilla. Their products are all natural with no added chemicals or preservatives and you can always buy their raw olives and have a go at marinating them yourself. All the tome I talked to them they were either serving customers or cutting each one of their raw olives which they later soak in salt to cure them before marinating. Their hands were busy the whole time. 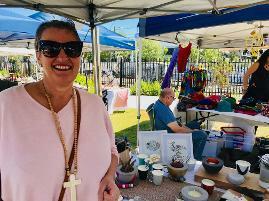 They can be contacted on 0488 227 411.
bellburn crafts stall is the brainchild of Shelagh Black. Shelagh, a local Blackburn resident, sells hand made cards, items for baby that she has personally made and when the weather turns cooler, her knitted clothes. She has made all the items she sells and has had a Blackburn market stall for 8 months. Shelagh started making things for her granddaughter (now 14 months old), including bibs, nappy holders, change mats, baby wear etc. She made many more than her granddaughter could use so had the great idea that others could benefit from her skills rather than just her granddaughter, hence the craft stall. Her granddaughter continues to be the “testing ground” for her new products so expect the range to increase as granddaughter gets older. As she makes everything herself, if you like something but not the colour or it is the wrong size, well she will make it for you. How’s that for service. 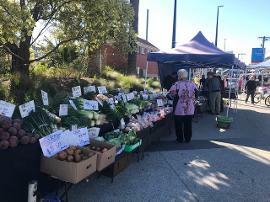 Shelagh has a stall at a number of markets including two other Rotary ones, Hawthorn Makers Market (1st Sunday), and Waverley Market (2nd Sunday). Good news is that she takes Visa & Mastercard. Jenny’s Cards stall has been a regular feature of our Saturday Blackburn Market for over 9 years. 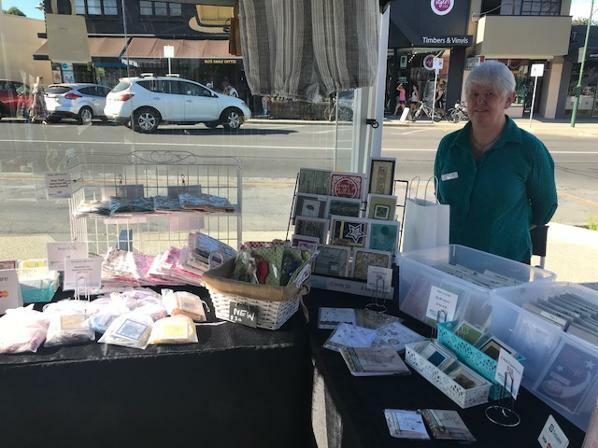 Jenny, a Box Hill resident, sells her own original hand painted cards in a range of sizes and her hand painted water colour framed paintings. The cards are 2 for $7 and 3 for $6 depending on the size and the framed paintings range from $18 to $70. 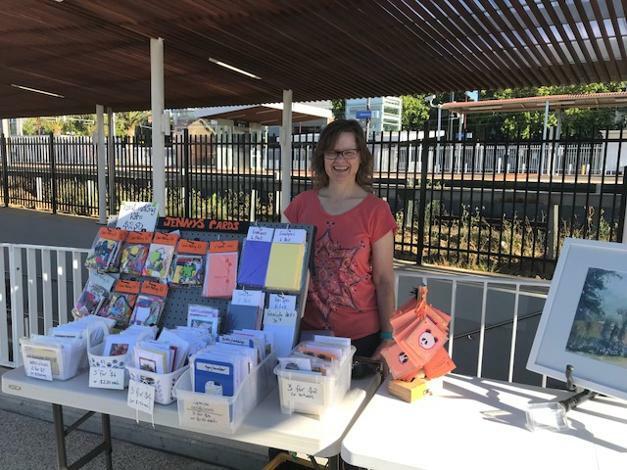 Jenny also sells papercraft cards which uses lots of recycled materials like cloth offcuts and chocolate wrappers and sells kits for $2.50 containing some cards and loads of cutouts so children can make their own cards. She started painting 12 years ago as a therapy because of her depression without showing any prior artistic skill and soon showed a great aptitude for water colours. She has been taking lessons until recently (as you can see from her skills, she should be giving lessons!). 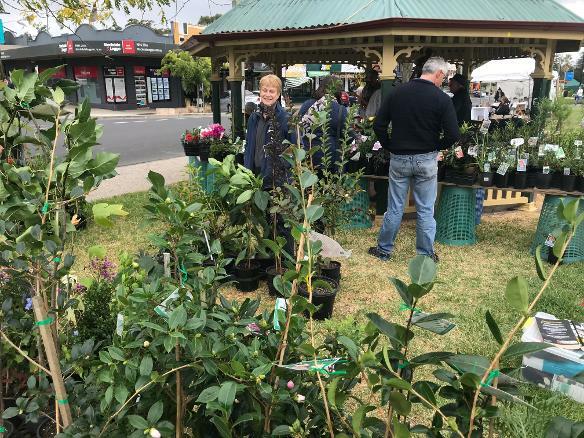 Jenny only attends one other market a month, the East Ringwood Community market on the 1st Saturday of the month. She told me that last year she sold 1,200 cards and 59 paintings. We would suggest you look her up next time you attend the Blackburn Market. Her cards and paintings are seriously good and very well priced.